When the Scottish author, Robert Louis Stevenson, wrote “Edinburgh is what Paris ought to be,” it is hard to know whether he was referring to the city’s stunning location, amazing architecture or vibrant creative literary and academic community. Edinburgh, the jewel in Scotland’s crown and its capital city, is visited by more than 12 million people every year. And for good reasons, as it is widely considered to be one of the world’s most beautiful cities. Whether you have a day, a week, a month or a year to spend in Edinburgh, there is always something to learn, see and do in this city. Edinburgh has more trees per head of population than any other city in the UK. 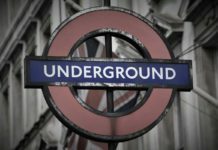 What and where to visit? There is no shortage of places to visit and things to do in Edinburgh. 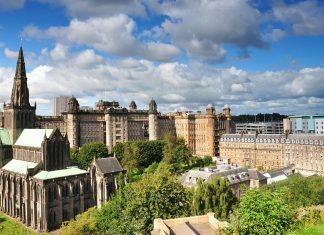 The city is well known around the world for hosting some exciting festivals, including the Fringe, the Jazz and Blues Festival and Edinburgh International Film Festival. 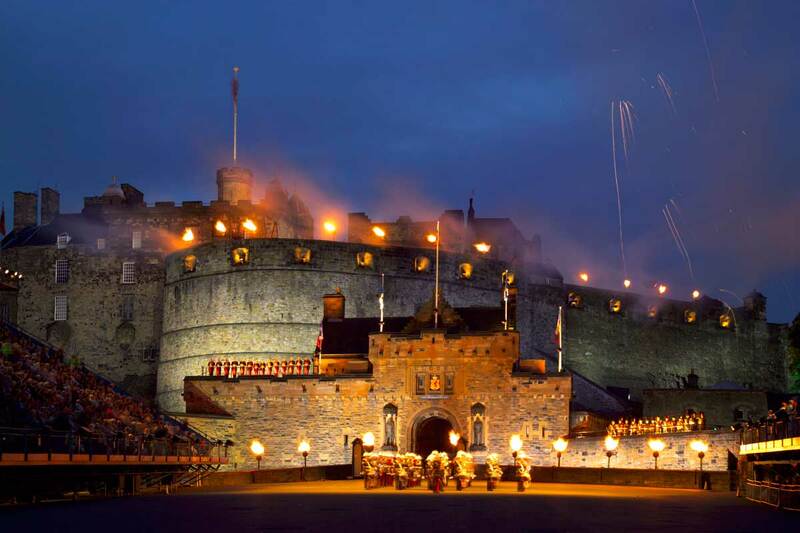 Amongst the must-do’s is to visit Edinburgh Castle, arguably one of the most popular and famous landmarks in the city. The castle sits on an extinct volcano which last erupted 350 million years ago. It has been home to royalty for hundreds of years including Queen Margaret, Mary Queen of Scots and James VI. 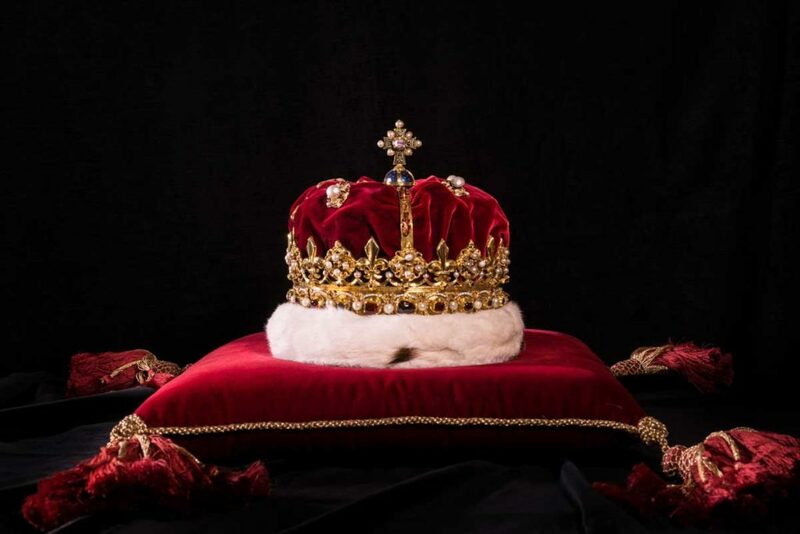 The castle is now home to the Crown Jewels of Scotland – which were first used for the coronation of Mary Queen of Scots in 1543, but then hidden from the British until 1818. Every day (except on Sunday) crowds gather at 1pm for the shooting of the One o’clock Gun, a tradition dating back to 1861. It was originally meant to signal that it was precisely one o’clock. You can’t miss The National Museum of Scotland, which is one of the Top 10 UK attractions and in the Top 20 of the most visited galleries and museums in the world. 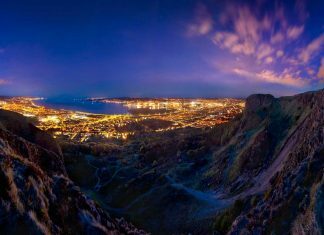 And for some adventure, unbeatable views and something a little more active, take a hike up Arthur’s Seat. This ancient, inactive volcano sits 251m above sea level, offering amazing views of the city. Luckily, it’s quite easy to climb from any direction, but the simplest ascent is from the east. Although exploring Arthur’s seat only takes one to two hours, those who want to do something outdoors but are more pressed for time would definitely enjoy Calton Hill, located right in the city centre. 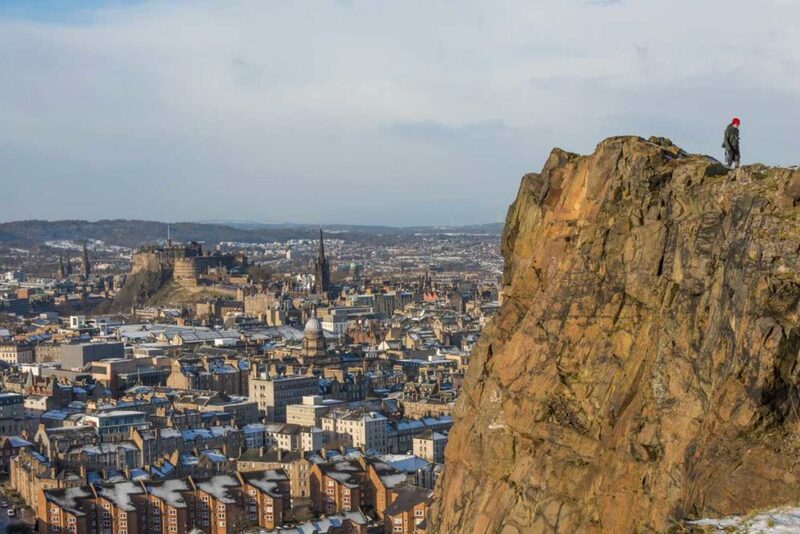 Also made of volcanic rock base, the hill’s craggy surface is dramatically stunning and offers panoramic views of the city and the Firth of the Forth. Right on top of the hill is the Acropolis, an imitation of the Athenian Parthenon. There’s also a couple other monuments and a small gallery, offering visitors many options to explore. In the warmer months you’ll find many students and locals relaxing here. For those of you that have a romantic streak, we recommend a visit to the statute of Greyfriars Bobby. The story has been made famous by numerous books and a Disney film of a Sky terrier dog that faithfully guarded over his owners grave for 14 years. If you’re looking for laughs get tickets for The Stand, one of the UK’s most iconic comedy clubs. All the top jokers, many who have gone to become TV celebrities, have stood behind the microphone here. 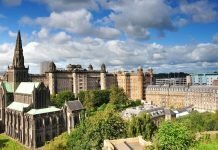 Edinburgh is a foodies paradise with great eateries littered all around the city, especially if you want to tick off with some classics. The list of ingredients may not sound that appealing but haggis is delicious. For the best haggis in Edinburgh head to Hadrian’s Brasserie at the Balmoral Hotel. 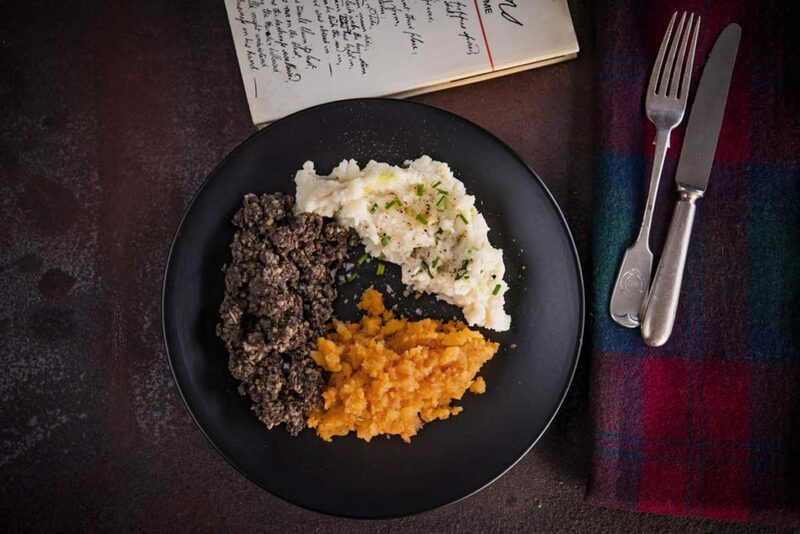 There you will be able to enjoy this very Scottish meal which is served with neeps (turnips) and tatties (potatoes). Equally good is a pork belly and haggis roll from Oink. It is legendary amongst visitors, students and residents for being the tastiest sandwich you will find in Edinburgh. And for the vegetarians among you, there are many renowned meat-free spots including Hendersons and David Bann. Technically it was the Irish that invented whisky but there is little doubt that whisky is the national drink of Scotland. Of course it is not surprising that Edinburgh is well served by Whisky Bars. The Amber restaurant and whisky bar is the places to head. The staff are extremely knowledgeable and can recommend something you are bound to love from the selection of 380+ whiskies. Whiski rooms on N Bank Street is another treasured spot. Eating good seafood isn’t hard to do in Edinburgh and the best way to enjoy it is the world famous fish and chips. The poshest fish and chips eatery in Edinburgh has to be Tailend. Here you’ll find a choice of fish from haddock, Finnan haddie and Arbroath smokies. Oh and the chips are cooked in beef dripping to make them extra indulgent. For seafood lovers looking for something a little more romantic, try The Ship on The Shore in Leith. This seafood restaurant and champagne bar overlooks the Water of Leith and has very traditionally Scottish decor. Different regions throughout the UK have their own version of oatcakes. Of course Scotland has its version, which is actually a biscuit that was traditionally eaten with each meal as the main substitute to break. Today Naim’s and Perthshire Oatcakes are popular brands in Scotland – and have variations, such as oatcakes with chocolate. If there are two things you should experience in Edinburgh they are the Hogmanay and Burns Night. Hogmanay is the extended New Year’s celebration that starts on 30th December and goes through to 2nd January. Traditionally Hogmanay has been more important than Christmas to Scots, partly because until 1958 Christmas Day wasn’t a public holiday. This is because the Protestant Reformation banned Christmas for 400 years, claiming the celebration had been born out of Paganism and had its roots in the Catholic Church. The second is Burns Night. Scots around the world celebrate the night on or around 25th January and commemorate the life and work of the poet Robert Burns. The day is traditionally celebrated with a supper at which haggis along with mashed turnips and potatoes are served. You can also visit the Writers’ Museum where you can see Burns’ portraits, rare books and personal objects including letters and his writing desk.